Rosh Hashanah, the Jewish New Year, is upon us again and AntiquityNOW wants to wish you peace and joy in the coming year. L’Shanah Tovah! This year the first day of the holiday falls on a Bon Appetit Wednesday, so it’s the perfect time to share some delicious recipes. For those who don’t celebrate Rosh Hashanah, it is easy to assume the food is very uniform, with all observers around the world dining on the same basic dishes year after year. While it is certainly true there are traditional foods with deep meaning and significance that are included in many Rosh Hashanah meals, there also exists a great variety among dishes (read our blog Traditional Meets Modern: Celebrating the Foods of Rosh Hashanah for more information on the traditional menu). The people of each country, region and household have been influenced by their ancient past. And so, a Rosh Hashanah cookie is not just a Rosh Hashanah cookie. It is flavored with unique and sometimes ancient ingredients, prepared and eaten by Jewish families who have planted roots all over the globe, and is passed down to future generations who will add their own twist to the recipes. A cookie becomes a wonderful fusion of past, present and future. Let’s explore two examples of how regional differences can create wonderful variations of favorite dishes. “Jewish cooking in France is a hidden story,” says cookbook author Joan Nathan. She explains that French Jewish communities have existed there for centuries but the diffusion of their culinary practices has not been widespread. However, if one takes the time to experience their cuisine, it is easy to see how the two cultures share a culinary past. Rosh Hashanah in France today has its own inimitable flavors that differ not only from the feasts in other countries, but also vary within the country itself depending on the region and the influences of that area’s past. 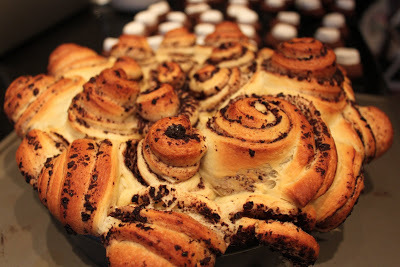 Enjoy a recipe for Babka à la Française (Babka Rolls With Olive Tapenade) below. While there is not a robust Jewish community in India, three small communities have existed there since ancient times: Bene Israel, Cochin Jews and Baghdadis. According to tradition, the Bene Israelis are descended from the lost tribes of Israel who escaped persecution in Israel around 175 BCE and ended up settling in modern-day Mumbai, where they were embraced by the local Hindus. Portuguese Jews fled the inquisition in the 16th century, relocating to a Jewish settlement in Cochin that has existed there since ancient times. Jews from Iraq and specifically Baghdad have been migrating to India since the eighth century CE. Today, very few Jews remain in India, but those that do cling to their traditions, which have been spiced by Indian culture and cuisine. A traditional chicken dish served at Rosh Hashanah might be mahmoora, chicken cooked with tomatoes, spices, almonds and raisins, served on a bed of pilau rice. The hallah is often dipped in sugar instead of salt. Jewish-Indian cooking in general is unique and differs according to the community. For example, a woman from the Cochin Jewish community, born in Israel, explains, “Our food isn’t like the Indian food you know. We use different spices. We stick to a few basic ones and don’t mix them up like the Indians do.” However, other communities adhere more closely to an Indian way of cooking. It depends on where you are and who is the chef. 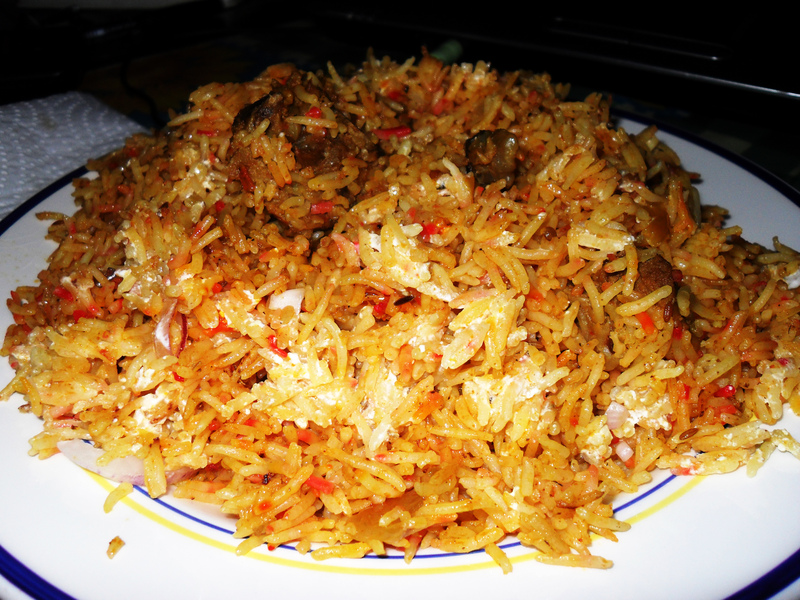 Enjoy a recipe for Lamb Biryani below. 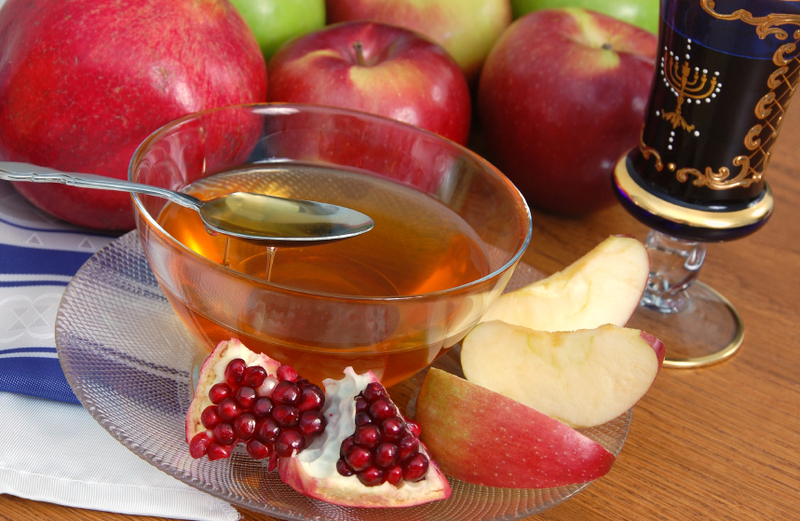 These are just two examples of the countless cultures that have blended to create new and unique Rosh Hashanah cuisine traditions. For a quick list of recipes eaten at the Rosh Hashanah tables in various countries, visit “An International Menu for Rosh Hashanah” by seriouseats.com. If variety is the spice of life, this year, why not make your holiday table an international one? * Recipe courtesy of Joan Nathan’s “Quiches, Kugels and Couscous: My Search for Jewish Cooking in France.” To see more of Joan’s fantastic recipes visit her website: http://www.joannathan.com. To make the dough, put two and a half cups of the flour, salt and all but one tablespoon of the sugar in the bowl of an electric mixer fitted with the dough-hook attachment. Put the yeast and one tablespoon warm water and the reserved tablespoon of sugar in a small bowl, and stir just until the sugar and yeast have dissolved. With the mixer, using the dough hook on low speed, pour into the bowl the yeast mixture, the milk and the egg and egg yolks. Knead the dough until it is smooth, shiny and elastic, about 10 minutes, adding more flour as needed. Add the pieces of butter a little at a time, until it is incorporated, then knead the dough on low speed for about five minutes, until it is silken and rich. Transfer it to a large, greased bowl, cover with plastic wrap, and allow it to rise for two hours. When the dough has risen, press it down and put it in a plastic bag or wrap it in plastic wrap. Refrigerate for one to two hours or overnight. To make the tapenade filling, put the olives, half the anchovies, the fennel seeds and one tablespoon of the olive oil in the bowl of a food processor fitted with a steel blade. Puree the mixture until it is smooth. Taste, and if you want, add more anchovies or salt and another tablespoon of olive oil if the filling is not smooth enough. When ready to assemble the babkas, grease two nine-inch round pans. Take the dough from the refrigerator and divide it in half. On a lightly floured surface, roll out one piece into a 16-by-12-inch rectangle. Using a knife or an offset spatula, spread half of the olive-anchovy filling very thinly over the dough, leaving a half-inch border all around. Beginning with the long side, tuck in the ends and roll the dough up tightly. Cut the rolled up dough into twelve equal pieces, and place them, with one of the cut sides of each facing up, in one of the pans in one layer. Repeat with the remaining dough and filling in the other pan. Allow the babkas to rise, covered with a towel, for two hours before brushing with the reserved two tablespoons melted butter. Preheat the oven to 350 degrees, and bake for 25 to 30 minutes, or until golden. Once the rolls are cool enough to handle, pull them apart gently into individual babkas. Cook rice in a rice cooker according to manufacturer’s directions, adding salt, a few strands of saffron and water. If you don’t have a rice cooker, begin by rinsing and draining rice. In a pan, heat up two tablespoons oil on medium heat, add the rice and lightly fry. Mix gently. Add salt, a few strands of saffron and water. Bring to a boil, mix and immediately turn down heat to lowest stove top setting. Cover with a lid and let water completely absorb. Turn off stove and let rice sit with lid on for at least 20 minutes. Gently fluff the rice with a fork to separate the grains. You can make the rice a day ahead and reheat in a microwave or oven. Cook lamb in a pressure cooker according to manufacturer’s directions with salt, bay leaves, allspice and water. Alternatively, bring lamb and water to a boil on the stove top in a large pot with salt, bay leaves, allspice and water; then immediately turn down to low-medium simmering/bubbling. Skim the foam. Half-cover with a lid and let cook for about 1 1⁄2 hours, or until lamb is tender and falls apart at the touch of a fork. It will be pretty pink inside. Drain liquid just before adding the lamb masala below. In a pot on the stove top, add the oil and onions and caramelize onions over medium heat until deep gold, stirring occasionally. While onions are caramelizing, put the garlic, ginger, cilantro and chili pepper into the food processor and chop to superfine consistency. Scrape the sides of and whiz again. Once the onions have caramelized, add the green mixture and cook on medium heat for few minutes, stirring occasionally. Mix in the salt, turmeric, garam masala and curry powder. Cook for a few minutes longer and turn off the heat. Add approximately half of the masala and all the drained lamb to a pan. Cook for few minutes while stirring on stove top. Add more masala if needed. You can reserve the remaining masala for vegetables and other dishes you wish to cook later in the week. Heat up 2 or more tablespoons of oil on medium heat and fry the onions until they turn a deep brown color and become crunchy. Scoop with a slotted spatula onto a plate lined with paper towels. This step should be done on the day you’re eating. As an alternative, you could use crunchy onions (like French’s) from the supermarket. In same oil you fried the onions, plump the raisins. It takes a minute or less. If you ended up buying French’s onions, then use only 1–2 tablespoons of canola oil to plump the raisins on medium heat. Use 1⁄2 cup raisins if using only as a garnish; add more, according to taste, if you wish to use raisins throughout the dish. Toss the cashews into a pan with oil heated on a medium flame until they turn golden. This process is very quick. If you wish to layer the biryani with cashews, use 1 cup. If using only as a garnish, use only 1⁄4 of a cup. This step can be done in advance; cashews can be kept in an airtight container on the counter. Or you can buy roasted cashews. Rinse and pat dry cilantro leaves with a paper towel. Flatten the leaves. Bring oil to medium heat and fry the leaves. This takes seconds. The crunch of these cilantro chips adds an amazing dimension to the dish. Preferably, this step is done the same day as serving. Layer the bottom of a deep, ovenproof deep dish with rice. Dot the rice with masala-coated lamb cubes. If you choose to use cashews and raisins as part of the layers, sprinkle some on top of the lamb. Top the lamb with a layer of rice and repeat the steps. The top layer should be rice, garnished with the crispy onions, raisins, cashews and cilantro chips. The garnishes should be added just before serving. The dish can be made ahead, kept refrigerated and reheated, covered with foil in a preheated 350-degree oven, for 20 to 30 minutes or until it is hot. It is sublime the day its prepared or a day or two later. Shulie Madnick is an Israeli Indian, recipe developer, cooking instructor food writer and food photographer. She blogs about food at www.foodwanderings.blogspot.com. Kagan, S. (n.d.). Joan Nathan’s French-Jewish Rosh Hashanah Menu – Rosh Hashanah / Yom Kippur | Epicurious.com. Retrieved September 21, 2014. Yoskowitz, J. (2010, November 4). The Hidden Foods of France’s Jews. Retrieved September 21, 2014. Nathan, J. (2010, August 31). Rosh Hashana Recipes Routed Through Africa. Retrieved September 21, 2014. Mittal, S. (2006). Religions of South Asia: An introduction (pp. 169-171). London: Routledge. Rosh Hashanah, Calcutta Style. (n.d.). Retrieved September 21, 2014. Kessler, D. (n.d.). Jews From Cochin Bring Their Unique Indian Cuisine to Israeli Diners. Retrieved September 21, 2014. This entry was posted in Blog, Bon Appetit Wednesday, Culinary, Culture and tagged ancient cuisine, ancient history, ancient recipes, AntiquityNOW, Jews in France, Jews in India, Rosh Hashanah, World War II. Bookmark the permalink.